The Eastern White Oak, or white oak, is hands down my favorite tree to hunt. Deer would rather eat white oak acorns than anything else I know of. I've had some great experiences hunting white oaks, including a hunt that I wrote about last week. 2008 Update: In the area of Tennessee where I am hunting this year, the white oaks have produced a bumper crop of acorns! Things are looking good. 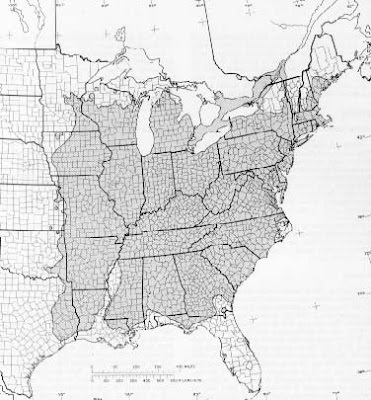 In the previous article, I wrote that the Northern Red Oak is the grand daddy of the red oak family. The Eastern White Oak fills the same role in the white oak family. It grows in virtually all regions of the Eastern U.S. As with the red oak, it reaches a large size and tends to overshadow other trees of similar age. White oaks are found on the tops and sides of ridges, similar to red oaks, but they also are commonly found in the bottoms of hollows. White oaks can grow in just about any type of soil except extremely dry shallow soils on ridges and wet bottomlands. Acorn production seems to be directly related to the amount of moisture available, with trees located in hollows and on the north-facing sides of ridges (where the ground does not get baked by the mid-day summer sun) generally being more productive. 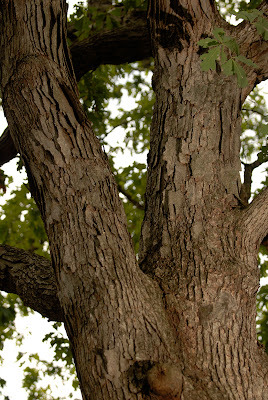 The bark of the white oak is unique and easily recognizable. 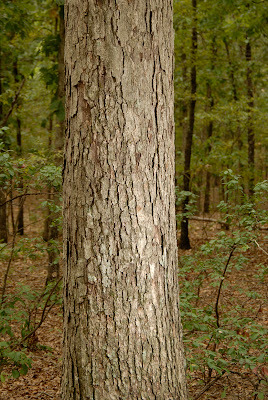 Near the base of the tree the bark forms small flakes in a relatively tight pattern. Further up the trunk, at about the level where significant limbs begin to form, the bark changes into large flakes or sheets. Two features in the second picture are characteristic of white oaks. Often the trunk will fork into two or more large sections. It is also common for some of the large limbs to grow almost horizontally, like the one on the left side of the right-hand fork in this photo. 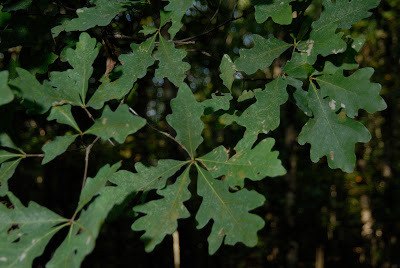 White oak leaves are dull green above and whitish green below. They have 5 - 9 rounded lobes that are widest beyond the middle of the leaf and taper back toward the stem. The acorns are long with shallow warty-looking caps. The green ones pictured here are immature. The brown ones are ripe. White oak acorns mature in one growing season, so the number of acorns produced each fall will be impacted by growing conditions in the spring of that year. Even under ideal conditions, a given tree will not produce acorns every year. Excellent crops are produced, on average, about every four to ten years. Individual trees will vary in their acorn output, with some trees consistently producing nuts and others never producing. Generally, trees on wetter north and east-facing slopes are more likely to have high acorn production than trees growing on drier south and west-facing slopes. Next, we will look at the Southern Red Oak. hey pursuit, I am fortunate enough to hunt several track of land public and private and on one of the tracks I am hunting I am having a bit of a problem. I am hunting a few white oaks on one of the tracks of private land, but it is a smaller track of land (119 acres) and one of the major white oaks on the edge of the property is starting to run out of acorns and deer are starting to go to my neighbors property. I do not know what it is they are going to but whatever it is they are not coming to the tree I need them to go to! o And this tree is the one I have had most buck sign around. how would you go about hunting this, thanks. Not much you can do to get them back if the deer have decided to move on. No dominant tree lasts forever. My advice would be to not assume they have gone to your neighbor's property until you've thoroughly scouted your 119 acres. That's plenty of room for them to be in. This time of year, they are likely sticking close to areas with thick cover. If you have any really gnarly areas on your property, I'd check around them. Just out of curiosity, what state do you hunt in? I wasn't aware that any seasons were still open. hey pursuit, i see at the top of the screen you can creat a blog, how does that work? thanks. This blog is hosted by Blogger, a Google company. Go to The Blogger Website and click on the orange "Get Started" button. It is pretty simple to set up a blog and the best part is... it's free! can you make a site just like this with a blog?